24-Oct-2010 -- This report is the fourth out of a series of five Confluences that I visited during an extended weekend to Morocco. The story starts from 33N 7W. With the arrival of the first daylight I started in the town Imouzzer du Kandar which is 40 km straight south of the city of Fès. A splendidly constructed road links the two cities, so it took less than 30 minutes to reach Fès by car. The Confluence is within city limits, about 8 km south of the ancient medina. It is located within 800 m from the main radial trunk road to the south (N8). Since I wanted to delay my visit until the daylight was bright enough for taking clear pictures, I walked directly from the main road. The area is typical suburban with fields, housings, and gardens. When I walked over a field, I got into extremely sticky mud. The amount of mud on my shoes got so severe that walking became a challenge, similar to what a stilt-walker is facing. The exact confluence location however, is particularly special: it is in the middle of an outdoor riding ring! 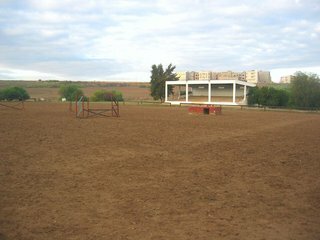 The riding ring is tiny (60 m by 80 m) and it is obviously the only riding facility in the area. The fact that the Confluence is right there is quite a coincidence. The only Confluence I know that is located on a similar facility is in a stadium in Georgia. The riding ring for horses includes two fences with rails used in show jumping. There is also a covered grandstand for an audience of 100. Right next to the ring, there are nicely gardened palm and olive trees, oleander, and a quince tree with ripe yellowish fruit. This all belongs to the Riding Club Equestre. At these early hours of my visit, there were no people around. There have been no significant changes since the first visit in 2002. Subsequent to the confluence stopover, I visited some sights in the medina of Fès. Time at the CP: 7:30 a.m. Description of the CP: In Morocco's North-Central region Fès-Boulemane, just 8 km south of the medieval city Fès. Unique location in a suburban horse riding ring. Story continues at 34N 6W.